Thomas Sandstrom has been practicing law in Friday Harbor since 2009 when he joined the Law Office of Christon Skinner. During his tenure with Chris, Thomas and now Honorable Kathryn C. Loring managed the Friday Harbor clientele until 2016 when Chris decided it was time to focus on his Oak Harbor practice. Thomas and Kathryn purchased Chris’ Friday Harbor practice and immediately joined forces with Peter Goddu and Margaret Langlie, who had moved to the island having purchased retired Superior Court Judge Donald Eaton’s practice when he was appointed to the Superior Court. The newly formed practice was Goddu Langlie Loring Sandstrom, PLLC. Kathryn C. Loring was appointed to the Superior Court in January of 2018 by Governor Inslee, after which the firm changed to Goddu Langlie Sandstrom, PLLC. 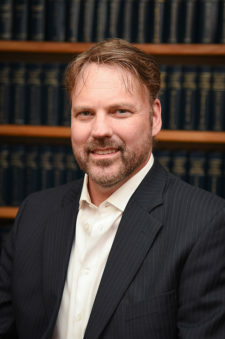 At Peter and Margaret’s retirement effective January 2019, Thomas retained the practice and has changed the name to Sandstrom Law, PLLC. Changes to the practice notwithstanding, relational focus is of utmost importance to Thomas and his staff, and they enjoy the eclectic mix of people that our island brings through the doors. The practice specializes in Probate and Trust Administration, Estate Planning, Land Use, Civil Litigation, Business, Real Estate and Transactional Law. Outside of the office, Thomas enjoys being active in our community. He works tirelessly as a member of the San Juan Rotary Club and can often be seen on weekends and at events with his wife Laura or playing guitar with his band MOJO Nation at various community events.